Every blogger strives to get one. Guess what? More organic traffic! As Google has become the synonym of search engines, let me interpret it into more visits from Google search. You are reading this means you are already into Blogging. Are you? If yes, then you must want to drive more traffic to your website using Google search? Many of new bloggers don’t know the process how the search engine works. There is a free tool provided by Google named as Google Webmaster Tools. Its main purpose is to help Google bots know about your website which leads to a better VISIBILITY and INDEXING of your site. Deep analyzing of your website. Critical errors and issues fixing. Make a google-friendly and responsive website. After creating a new blog, add your site to Google Console on the first go. A new blog always takes time to get indexed as search engine bots are not aware of it. Unless you are updating it regularly or trying out any search engine ping tools. Setting up your website on Google Webmaster Tools pulls you one step close to your aim. 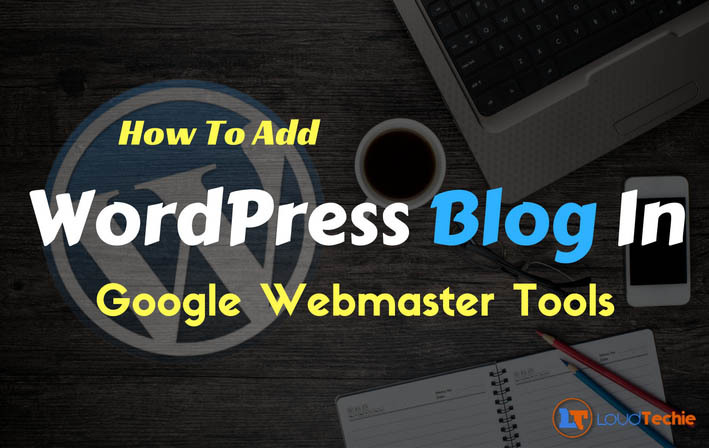 That’s why I am going to share the exact methods to set-up Webmaster Tools for your blog. So, without further ado, let’s get into the core of the post. How to Setup Google Webmaster Tools? I have divided the process into several steps for your convenience, which you can find below. Step 1: Just go to Webmaster Tool. If you have any properties you already added, you can see them there. In case you don’t see any, just click on Add a property icon. Step 2: You can add both Android App and website into Google Search Console. Choose the right one here. Don’t forget to enter your website address as well. Then, press Enter. Step 3: The next step is verifying your property. Google wants you to complete this step in order to confirm you are the owner of the site. 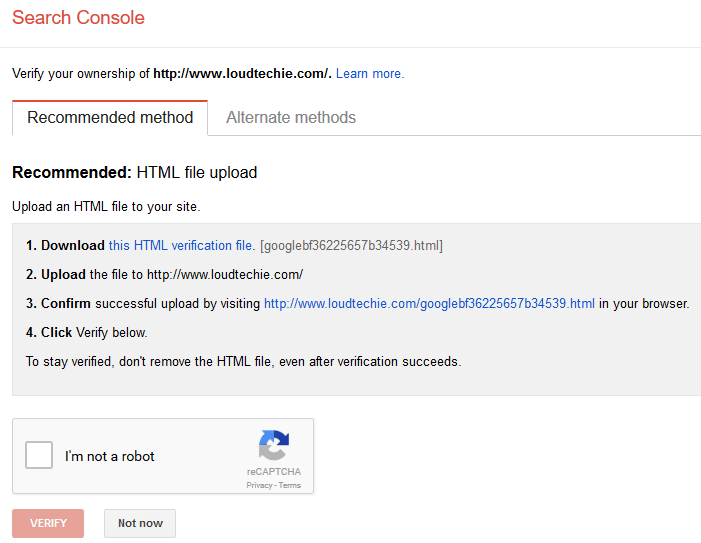 There are many different ways to verify your site on Google Webmaster Tools. Let me explain each one for you in detail. If you go with this method, you will have to upload an HTML file with a unique name into the root of your server. You need to use an FTP client or the built-in file manager on your cPanel to upload the file. From my experience, I find this one to be the easiest. Download the file, upload, verify and you are done. In case you don’t have an FTP client or you don’t know how to use one, you can move on to the following methods. Are you a Blogspot user? Then, this is the best method for you. All you have to do is copying the meta tag Google provides and paste the same before </head> tag. WordPress users should paste it inside header.php. NOTE: You may have to do this step every time you change your theme, though. This method is only for WordPress users. 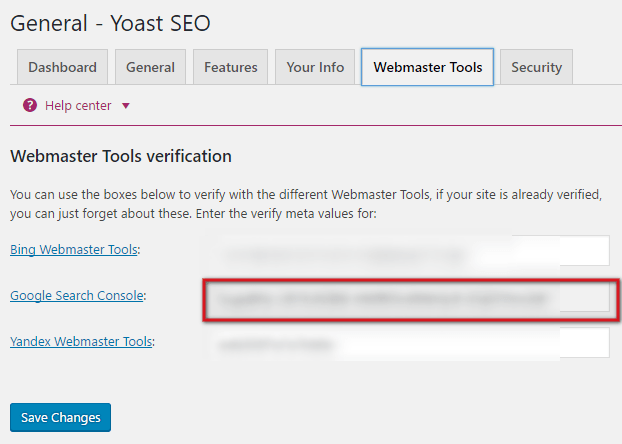 You are using Yoast SEO plugin, aren’t you? Once you add your site on Search Console, go to alternate methods and choose HTML tag option. You can see some unique characters after content= inside the quotation. Just copy it. Now, log into your site dashboard and go to SEO>> Dashboard>> Webmaster Tools. You can see Google Search Console there. Just paste the copied text there and, hit Save Changes. Go back to the verification page on Webmaster Tools. Click Verify. That’s it. I hope you now know how to add your WordPress blog to Google Search Console. If you have any doubts, don’t forget to drop a comment below. I will get back to you at the earliest. Don’t forget to share this article with your blogger friends on social media. Adding website to the google webmaster, the webmaster know the health of website. It is necessary and helpful. Good information shared with images. Yes Sanjeet, being added with webmasters tools anyone can analyze his website completely. Many information about a website such as sites linking, errors, issues, the responsiveness of a website on other devices. Webmasters tools also help you in improving the indexing of your site.